Yesterday, at the European Physics Society (EPS) Particle Physics conference in Vienna, we moved from parallel sessions to plenary sessions. The tasks of the speakers is now to summarize the hundreds of results presented so far at the conference, and draw the big picture. For the past two years, the Large Hadron Collider underwent major upgrade work. Experimentalists have used this downtime to look at all collected data from all possible angles (and a few more!). With final calibrations and improved algorithms everywhere, nearly all analyses now included all data collected at 8 TeV. In most cases, months of hard work for hundreds of people only slightly improved the resolution. But these rock solid results have unfortunately not revealed new discoveries. That’s the bad news. The good news is that four times more data is expected in the coming year at higher energy, making new phenomena accessible. Here is one example. Both the CMS and ATLAS experiments are looking for heavy hypothetical particles that would decay into two of the known bosons, namely photons, Z, W or Higgs bosons. In turns, the last three bosons could decay into jets of light particles made of quarks. A particle decay is very similar to making change for a large coin: the initial coin does not contain the smaller coins but can be exchanged for smaller coins of equal value, like on the diagram below. The four pieces of 50 centimes could come either from a two euro coin or from two coins of one euro. Likewise in our detectors, when we find four jets of particles, they can come from two independently produced Z, W or H bosons, or simply from four quarks produced directly. All this is called the background while the signal in this case would be a new boson that first decayed into two bosons. A particle decay is like making small change for a large coin. A coin only has one value but a particle carries both mass and energy. When one breaks a large coin, its total value is conserved. With particles, we must take into account the mass and the energy of all the decay products to calculate the combined mass of the original particle. One last detail: when the initial decaying particle is much heavier than the two bosons it produces, the jets coming from these bosons will hardly be separated. They will fly along side each other. In the end, we will not see four jets but rather two broader jets. 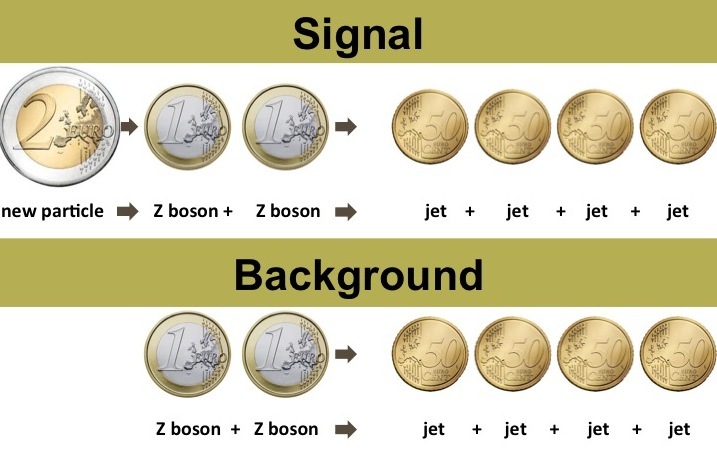 If the two broad jets come from two unrelated Z bosons, their total combined mass will be random, just as if we were to sum up the values of the small coins we carry in our pocket. If thousands of people told us the value of their small change, we would get a distribution like the one shown below by the blue line. Most people have only a little change, but some carry a small fortune in coins. The horizontal axis gives the combined mass value of each event containing two broad jets found by the ATLAS Collaboration. The vertical axis shows (on a logarithmic scale) how many events were found with a particular value. The blue line shows what is expected from various backgrounds and the other colourful lines correspond to a few hypotheses. The black dots represent the real data and would look similar to the blue line if nothing new were there. A small bump shows up around a mass value of 2 TeV, that is, more events are seen in data than what is predicted. The excess is 3.4 σ. Since there is always a spread in measured values due to the experimental errors, such a difference would occur at least once if we were to measure this quantity 1000 times. Hence, it is to early to say this could be the first sign of something new like a hypothetical boson denoted W’. 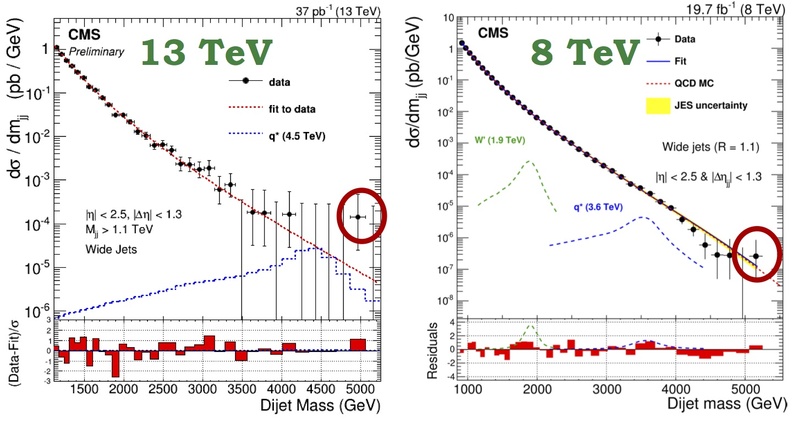 Intriguing events found by CMS with a mass around 5 TeV in the new (left) and old (right) data. The CMS Collaboration also showed a few intriguing events. 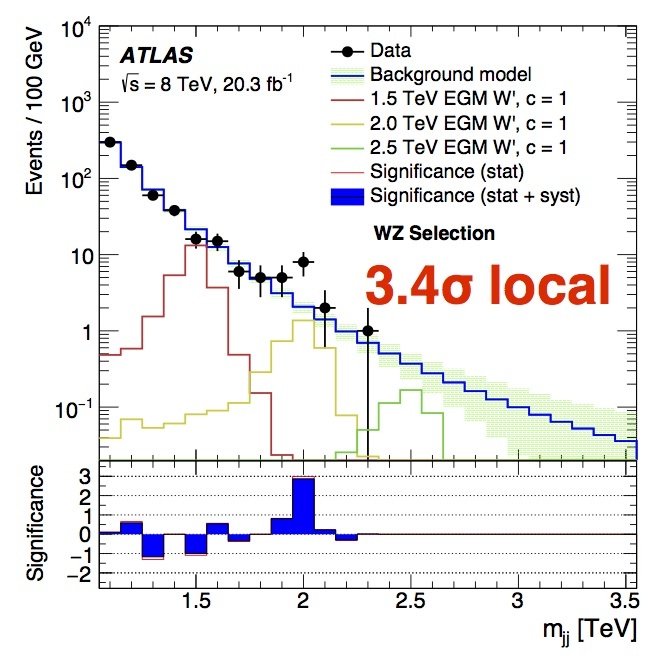 One is found in the newest data collected at 13 TeV after the restart of the LHC. The two jets combined mass is 5 TeV (left figure). The second event comes from the data collected earlier at 8 TeV and has a mass of 5.15 TeV. With 500 times less data at 13 TeV than 8 TeV, the experiments are already extending the analyses started with the 8 TeV data. At this stage, it is way too early to tell. This is similar to looking in the distance on a foggy day, at dusk, trying to see if the train is coming. A faint shape is visible but is this real or just a mirage? No one knows, we must wait for the train to come closer. But not for long since the LHC is on track. Both experiments should soon have enough new data to be more definitive. And then, hold on to your hat, it’s going to get really exciting.